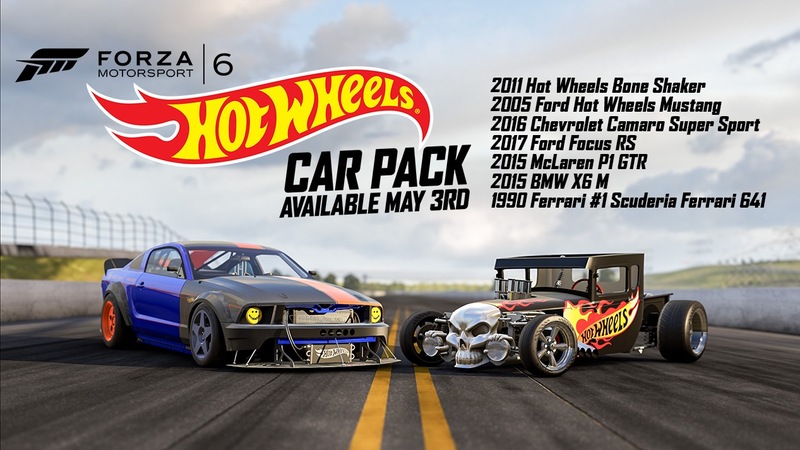 A new downloadable content (DLC) pack for Forza Motorsport 6 adds seven new cars to the game’s expansive range of racing machines, including a tricked-out, Hot Wheels-designed Ford Mustang. The new car is based on the 2005 Ford Mustang GT, boasting a wild orange-and-purple paint scheme with exposed carbon fiber and electric blue pin striping, massive fender flare extensions, a low-hanging front splitter, and plenty of other mad body modifications. The 1:64 scale toy on which the in-game car model is based was made to celebrate the Ford Mustang’s 50th birthday with panache, allegedly designed to mimic the styling sensibilities of a Japanese “Bosuzoku” race car. In addition to the 2005 Hot Wheels Ford Mustang, the Hot Wheels Car Pack for Forza Motorsport 6 grants players access to six more cars not previously available in the game, including the new Ford Focus RS, and 2011’s Hot Wheels “Bone Shaker” hot rod. The latter machine is modeled after an early-twentieth-century coupe with a Chevy small-block, flame decals, and a gigantic metal skull where one might expect the grille to be. The 2005 Hot Wheels Ford Mustang, along with the rest of the new Hot Wheels Car Pack gang, is available for Forza 6 players to download for $6.99.